Telfair Museums provides many opportunities for families to visit the museum, learn, and make art together. If you’re looking for a fun and educational activity for children, you’ve come to the right place! Start your day with art with our new and combined programs! 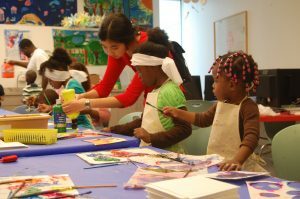 Once a month, our youngest patrons are invited to the Jepson Center for story time, a special tour, and an art activity. Strollers, crying babies, toddlers, and older siblings are all welcome here. Come play and learn with us! Each month we offer fun new art projects at our daily Drop-In Studio to relate back to the exhibitions on view in the museum. Telfair Museums’ Free Family Days for Chatham County residents are offered throughout the year. Enjoy music, artist demonstrations, and hands-on art-making, and more — free of charge! 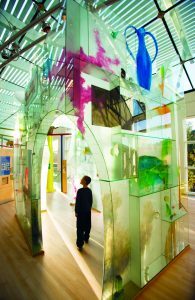 A great place to visit after school, on rainy days, on weekends, or just anytime, Telfair’s hands-on learning gallery and interactive exhibits provide an excellent introduction to big ideas about art.